The story: With a rich history of master cabinetmakers stretching back to the late 1800s, Humphrey Munson has earned a reputation for excellence in the design and manufacture of beautiful handmade kitchens. The Nickelby design embodies the true spirit of the classic contemporary kitchen, using a combination of painted solid wood cupboards and smoked oak accent units. This scheme features touches of pure luxury throughout. The key design goal of the homeowners was to install an extremely well made kitchen with quality appliances that would stand the test of time. It had to be timeless with all aspects using the best quality materials and appliances. The new kitchen is accommodated within a beautiful timber-framed orangery and includes a bespoke refectory table that we constructed on site due to its size. With three children under 11, the homeowners also needed to accommodate their different needs including family cooking and mealtimes with space for homework and playtime. Ensuring the space was adaptable was also vital for entertaining. Q) How did you answer that brief? As with every design, ensuring a clear symmetry to the project was a key consideration. We look at every angle and assess the overall balance of the kitchen so that when it’s installed, it looks and feels perfect. The design of the orangery allows light to flood in along one length of the kitchen so we wanted to ensure that light source was utilised to maximum effect. Installing the distressed mirror splashback situated behind the range cooker allows the light to reflect back over the island unit, as do the hammered nickel pendant lamps. Bearing in mind the scale of the kitchen, and the needs of the homeowners, we felt that providing a separate scullery with a butler sink and dishwasher was important to provide a distinct area for washing up and kitchen chores. This was a huge hit with the homeowners. 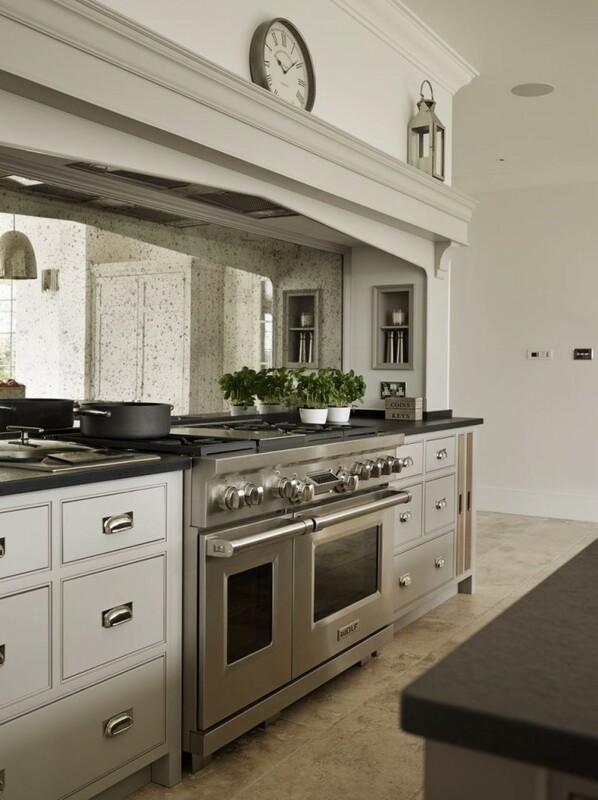 A Wolf range cooker and electric steamer, together with Sub-Zero refrigeration drawers, fridge freezer and wine preservation units were chosen, as the homeowners had requested state-of-the-art appliances that would stand the test of time. Sub-Zero and Wolf have an international reputation for excellence that is unsurpassed but the products themselves also have a design aesthetic that is very much in keeping with our design goals. Yes, the kitchen was part of a larger renovation project of an old farmhouse. The orangery, which houses the kitchen, was built by Westbury. The sheer scale of this project, together with the exceptionally high specification of the design, makes this kitchen genuinely thrilling. Every element, from the polished nickel handles to the integration of the Wolf steamer cooktop has been precisely considered. This meticulous attention to detail ensures the kitchen is true to the homeowners’ original design brief and utilises all the innovative expertise our years of experience have provided. Even if your kitchen isn’t as big as this one, carefully zoning the different areas will really help to create a cohesive design that meets your needs. Hayley loves: the nickel cup handles, which complement the pendant lights beautifully.